Old Silent Inn01535 640792work Public HouseThe Old Silent Inn offers not only fine cuisine but a traditional pub steeped in history - the pub dates back over 400 years. The antiquity and mystique of the Old Silent Inn has inspired authors to write fictional novels based upon the pub - it is rumoured that Bonnie Prince Charlie used to frequent the premises! Parking. Vegetarian options. Groups accepted by arrangement. Children welcome. Beer garden. Credit cards accepted. 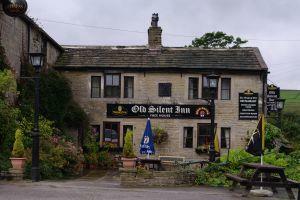 The Old Silent Inn offers not only fine cuisine but a traditional pub steeped in history - the pub dates back over 400 years. The antiquity and mystique of the Old Silent Inn has inspired authors to write fictional novels based upon the pub - it is rumoured that Bonnie Prince Charlie used to frequent the premises!